Vacuuming is a chore that most people hate to do. But what if you have the right kind of vacuum cleaner that is so easy to use and gets your job done within minutes? I’m talking about the Dyson V8 Absolute Cord-Free Vacuum, a lightweight, cordless, high suction vacuum cleaner that has totally redefined vacuuming. With the kind of efficiency that you would expect from a high end upright vacuum cleaner, the Dyson V8 does a great job, picking up dirt, dust, pet hair, and almost anything from floors, thereby delivering spotless cleaning. Powerful, quieter, lightweight, easy to maneuver and easy to use: what more do you want from a vacuum cleaner? The Dyson V8 Absolute does its job very well and delivers great results, making the cleaning chore a really enjoyable one for its users. Let’s take a detailed look at the various reasons why you should consider buying the Dyson V8 Absolute Cord-free Vacuum. Features, 1) Cordless 2) HEPA filtration 3) Hygienic Dirt Ejector 4) Up to 40 minutes of Powerful suction 5) Convenient Docking Station 6) Crevice tool for hard to reach places 7) Soft dusting brush for gentle dusting 8) Mini motorized tool to get rid of pet hair and ground-in dirt 9) Soft roller cleaner head for large debris. 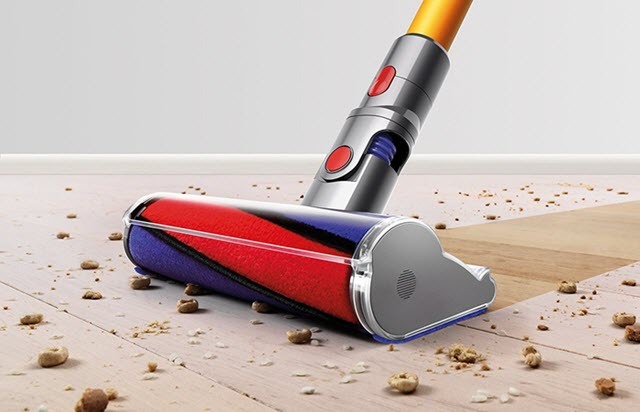 With double the suction power of most of the vacuum cleaners out there and offering cordless, hassle-free operation, the Dyson V8 Absolute Cord-free Vacuum Cleaner is definitely a worthy contender. 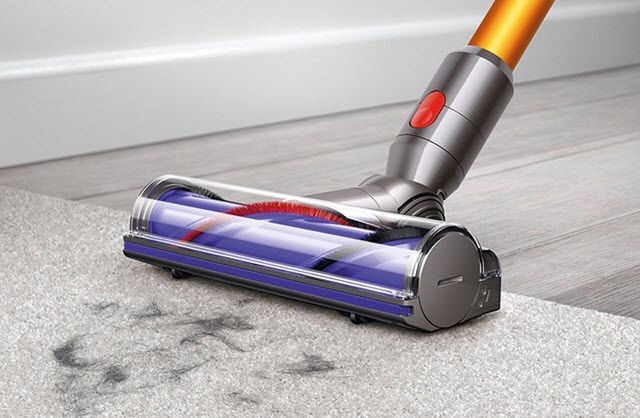 Whether it’s pet hair on the couch or spilled cereal on the floor or dirt on the carpet, the Dyson V8 Absolute Cord-free Vacuum is up for any challenge and guarantees to deliver perfect cleaning results. The improved suction power of the vacuum is capable of sucking up twice the amount of dirt and dust when compared to other vacuums. 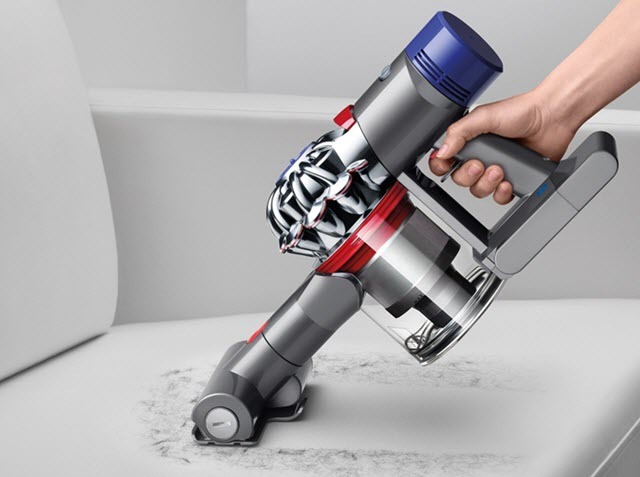 Being lightweight and having the ability to transform into a hand vacuum, Dyson V8 is an ideal tool for cleaning cars and upholstery. The unit also comes fully loaded with a variety of tools and accessories that enable it to clean just about any kind of surface. The soft roller cleaner head, mini motorized tool, direct drive cleaner head, combination tool and rigid crevice tool all are designed to carry out every cleaning task you can possibly think of. When it comes to emptying the bin, the Dyson V8 vacuum makes it a rather simple task by introducing few refinements from the earlier versions. All you need to do is release the hook at the top and pull upwards. This opens the lid at the bottom and ejects all the dirt. You don’t have to worry about dirt getting trapped along the sides of the bin due to its static nature. There’s a rubber collar which slides down the side of the bin and scrapes all the excess dirt off. This means you don’t have to clean the inside of the bin manually. 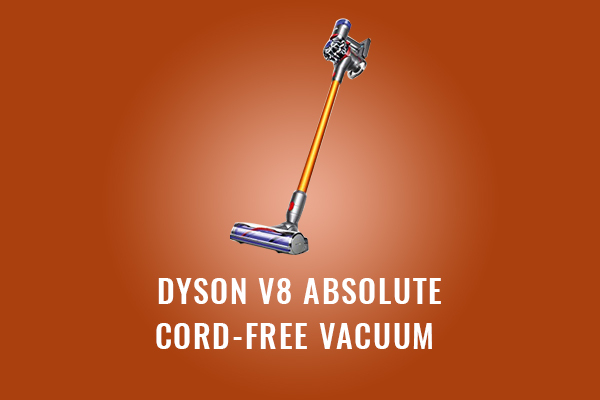 The Dyson V8 Absolute Vacuum cleaner is a multipurpose vacuum cleaner that can be used both as a handheld cleaner as well as a ceiling cleaner (by attaching an extended cleaning head). Let’s go through the other features that make this vacuum cleaner a super hit. Compared to its predecessor, the Dyson V6 that had a battery life of 20 minutes, Dyson V8 has an increased battery life of 40 minutes, which is enough to clean a medium-sized home easily. With the motorized floor tool attached, the unit delivers up to 25 minutes of powerful fade free suction. The unit comes with a battery runtime indicator that gives a display of how much more time the charge will sustain. A matter of concern for many vacuum cleaner users is the annoying sound their device makes while cleaning. But, with the Dyson V8, you can expect a perfectly quiet operation, which is made possible by using acoustic felt in the motor that helps absorb vibrations and streamlined air passages that decrease turbulence around the motor control board. One of the most convenient features of the Dyson V8 is that it doesn’t have a cord to unravel, plug in, and limit your reach. The cordless feature makes the cleaning process hassle-free as you can clean anywhere when you need the job done quickly and easily. Dust, dirt, and pet hair can sometimes cause allergies and other problems. The HEPA (High-Efficiency Particulate Air) filtration system of the Dyson V8 helps traps these pollutants and throws back less dirt and dust particles into the room as you clean. 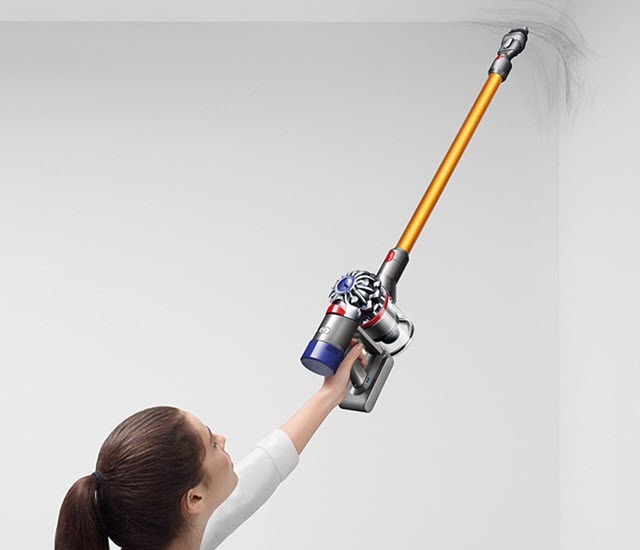 The Dyson V8 offers a max power mode, which provides up to 7 minutes of more powerful suction. Although this mode cannot be used for extended cleaning sessions, it is very useful in getting rid of stubborn dirt and pet hair. With a wide range of tools for every cleaning job, improved filtration, and powerful suction, clearly, the Dyson V8 Absolute Vacuum tops every other cordless vacuum cleaner available on the market. It is one of the most versatile and easiest-to-use vacuum cleaners available. Attaching and removing accessories is quick and easy which means transforming from a hand vacuum to a full vacuum happens within a few seconds. The Dyson V8 is undeniably the best cordless vacuum cleaner available today but the price is a bit on the high end for most people. But if you are looking for the best vacuum and ready to shell out the added expense, you should definitely go for the Dyson V8 Vacuum. Guaranteed, you’ll never regret the decision!